Elegant semi-custom 3,152 sq ft home loaded with upgrades on an over sized lot. 4 bedroom plus den split floor plan features great room , family room, gorgeous tile flooring, 10’ ceilings, media niche, custom warm neutral paint, surround sound, and 3 car garage with built-in cabinets. Gourmet island kitchen with granite counters, ample 42” cherry cabinets staggered with crown molding, breakfast bar, and walk-in pantry. Huge master retreat with walk-in closet, separate shower and jetted soaking tub, dual sinks, private toilet room, and separate exit leading to the backyard. The incredible backyard features a refreshing pool, extra cool decking, extended covered patio, built-in BBQ, pavered seating area, and lush mature landscaping. In Gold Canyon’s highly sought after Foothills community surrounded by amazing views of the Superstition Mountain and serene Mojave Desert. 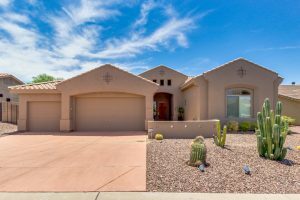 The community offers a year round heated pool, miles of walking and paths paths, and a short distance to several top rated golf courses and ample dining and shopping options as well as a multi screen theater including an I Max.